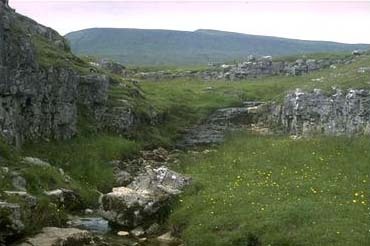 This small stream tumbling over exposed limestone on the eastern side of Ingleborough, is typical of many of the moorland streams which feed the infant Ribble. The force of moving water has widened and deepened a natural crack in the rock. ....and plunges 60 metres down to a ledge, before cascading down for another 30 metres. In the early stages of most rivers water falls are common. 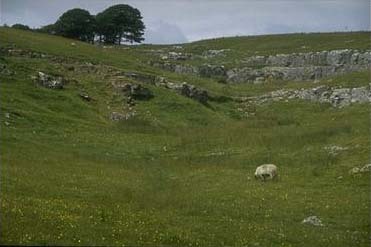 In limestone country, like the Yorkshire Dales, most of the waterfalls are underground. Once water has found a pathway down through small cracks, these are widened, not just by the water, but by the pebbles and stones which are carried along with the water. In addition to the physical erosion, rainwater is slightly acid, and reacts with the calcium carbonate of the limestone (chemical erosion). 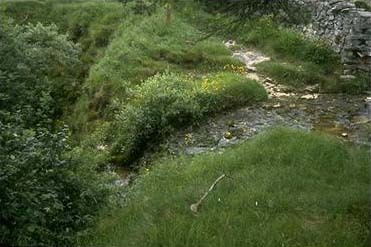 This is the dry valley through which the stream used to flow, before it found an alternative underground route. The group of trees mark the entrance to Alum Pot. 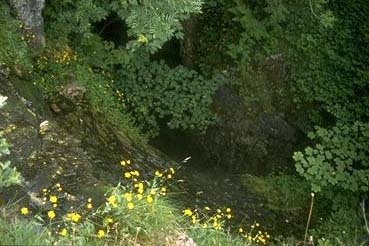 The stream emerges, as a spring, a few metres further down the valley.